TheraBand® Kinesiology Tape features best-in-class adhesion from Cramer Sports Medicine and an exclusive innovation from TheraBand -Â XactStretch™ visual elongation indicators for impeccable application every time. This new product is the remarkable result of ongoing innovation and Performance Healthâ€™s acquisition of Cramer Products, Inc.
TheraBand Kinesiology Tape's exclusive integrated stretch guides, XactStretch, eliminate misapplication, even for beginners; additionally, it features Cramerâ€™s best-in-class adhesion and durability. 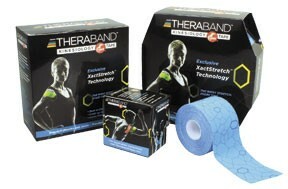 The productâ€™s website, www.TheraBandKTape.com, provides access to a comprehensive kinesiology tape research library, featuring a collection of over 200 research abstracts including Performance Health studies, as well as demonstrations of the most common tape applications. TheraBand Kinesiology Tape is safe and effective in supporting muscles and joints, and providing pain relief. It is latex free, non-irritating and allergy tested, and features exclusive XactStretch for reliable application; best-in-class adhesion for up to 5 days; a unique, hassle-free single roll dispenser; and numerous packaging and color options. Headquartered in Akron, Ohio, Performance Health is a leading designer, manufacturer and marketer of branded rehabilitation and wellness products sold in a variety of U.S. clinical markets, prominent national retailers, and in over 60 countries through a multi-national network of distribution partners. TENSnet.com has been serving the chiropractic industry for almost 10 years and has helped practitioners save thousands of dollars. Located in Boca Raton, Florida, TENSnet delivers over 25,000 products to clinics throughout North America, usually at a lower cost than other suppliers. "As a small, family-owned business, we have streamlined our processes and depend highly on word-of-mouth referral so that we can pass along savings to our customers to help them keep a low overhead and increase their revenue", says David Tucker, TENSnet's President. "We also like to get to know our customers and treat them like family, becoming a resource for them as well as a supplier." TENSnet's product offerings include electrotherapy and laser units and accessories, cushions, pillows, traction, massage supplies, hot and cold therapy, treatment tables, nutritional supplements, topical lotions and gels, headrest paper, ultrasound, braces, collars, supports, rehab and exercise equipment, and more. You can order online at the company's website or they welcome you to call them. And when you call, David or a family member will be there to answer the call. You are assured that when you call TENSnet, you always speak to an owner. TENSnet is committed to the advancement of chiropractic care and educating the public on alternative treatment options without the use of harmful medication. To learn more, call David Tucker, email him at dtucker@TENSnet.com.